State Library Victoria – A Midsummer Night’s Dream: opera screening. A Midsummer Night’s Dream: opera screening. A Midsummer Night’s Dream : an opera in three acts, is the next program in the Music and Dance on Film series to be screened this Wednesday 9 November in Arts. This magical opera features music by Benjamin Britten. Libretto by Benjamin Britten and Peter Pears. It is adapted from Shakespeare’s A Midsummer Night’s Dream. 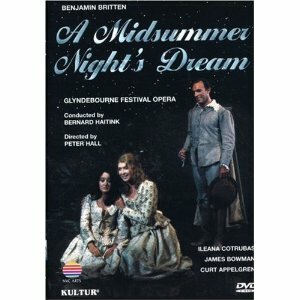 Features Felicity Lott, James Bowman and artists of Glyndebourne Festival Opera. With The Glyndebourne Chorus and London Philharmonic, conducted by Bernard Haitink. Directed by Peter Hall. The program commences at 12.00 noon and concludes at 2.30 pm approx. It will be held in the Arts Listening-Viewing Room. Enter via the Arts Reading Room and Audio-Visual Centre (from Trescowthick Information Centre). Admission is free. No bookings required, but come early as seating is limited. Enjoy!